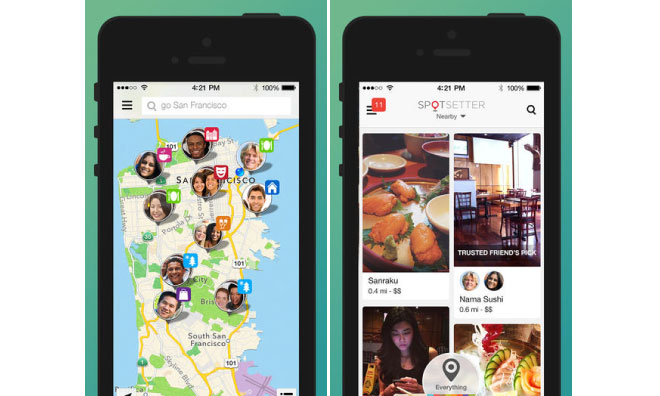 Spotsetter, a Silicon Valley startup that analyzes a user's social circle to surface more relevant recommendations for things like places to visit or new restaurants to try, is said to have been acquired by Apple for an unknown sum. Apple is believed to have made the deal in order to get access to Spotsetter's recommendation technology, which could be added to Apple's Maps. The acquisition was first reported by TechCrunch. Though many of Spotsetter's employees —including cofounders and former Google Maps engineers Stephen Tse and Johnny Lee —have moved to Cupertino, it was not strictly a so-called "acquihire." The company is said to have filed patents related to its recommendation algorithms, which may have been of interest to Apple. Spotsetter raised less than $1.5 million in venture financing, likely making the acquisition price in the mid-tens of millions of dollars. That represents a relatively standard acquisition for Apple, despite the company's recent spate of high-profile purchases including the recently-finished $3 billion deal for Beats Electronics. In a blog post announcing Spotsetter's shuttering six days ago, Lee said that they were closing down the app but "still have big dreams for personalized search for places and look forward to seeing great progress in this area."